Betty has been an orchid hobbyist in Southern California for over almost 30 years. She has grown orchids in Long Beach and Huntington Beach, and, since 2003, in the Point Loma area of San Diego. Betty started raising orchids in the early 1980’s when her husband and co-orchid grower Steve brought home a discarded cutting/keiki of a red Epidendrum he found in a trash bin in the alley beside their home in Long Beach. He planted the unimpressive and bloomless cutting on a moss-covered rock and confidently predicted that it would bloom beautifully in no time. When the Epidendrum actually did bloom and, in fact, never since has stopped blooming, the disbelieving Betty became an orchid enthusiast and both of their collection of orchids has since grown with the unwavering passion so often accompanying that first orchid discovery. Betty and Steve grow a large selection of predominantly species orchids. Their more than 800 plants grow outside in a small greenhouse and in a recently constructed shade structure. Betty enjoys the challenge of replicating the demanding environments required by species orchids and particularly enjoys the challenge of growing pleurothallids. 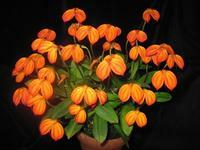 Over the last few years she has become a successful Masdevallia and Dracula grower. Masdevallia ignea 'Windflower' AM/AOSBetty began growing pleurothallids after she joined the San Diego County Orchid Society in 2005 when she was informed by several members that her home in Point Loma was a good environment for growing her favorite but not yet successfully grown orchid, Masdevallia veitchiana. She was also encouraged to join the Society’s Species Group. As a result, Betty began growing Masdevallias outside in her yard, under a small overhang that partially shaded the side patio area of the house. This particular location has become a perfect micro-climate for shade-loving, cool-growing orchids and Betty’s Masdevallia collection has since grown to 150 plants, almost all of them species. In addition, she grows more than 60 species of Draculas and several of her Masdevallias and Draculas have been awarded American Orchid Society awards. In recent years, Betty has established a small but, quite functional orchid flasking lab in her home where she has been hobby flasking and raising predominantly species orchids for about three years. Betty’s talk will be a combination travel log/orchid talk about the Orchids of the Machu Picchu Sanctuary in Peru where many of her favorite orchids are endemic. Just before her talk she will provide a short culture class on growing Masdevallias and Draculas and other cool-growing pleurothallids.